John 5 announces the release of his new single “This Is My Rifle,” from his upcoming album Careful With That Axe through 60 Cycle Hum. “This Is My Rifle” will be available digitally on June 17th everywhere digital music is available. 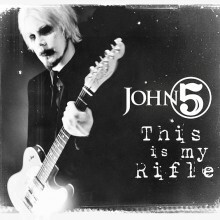 With rapid-fire, machine-gun riffs, anthemic sweeps and John 5’s blistering fast six string assaults, “This Is My Rifle” is the first single from John 5’s new album and features Rodger Carter on drums and Matt Bissonette on bass. Additional information on Careful With That Axe will follow in the coming weeks. John 5 hits the road with Rob Zombie this June in support of Rob Zombie’s 2013 release Venomous Rat Regeneration Vendor. Rob Zombie’s first concert film The Zombie Horror Picture Show DVD, featuring John 5, was released May 19 on Blu-ray, DVD and longform digital video.